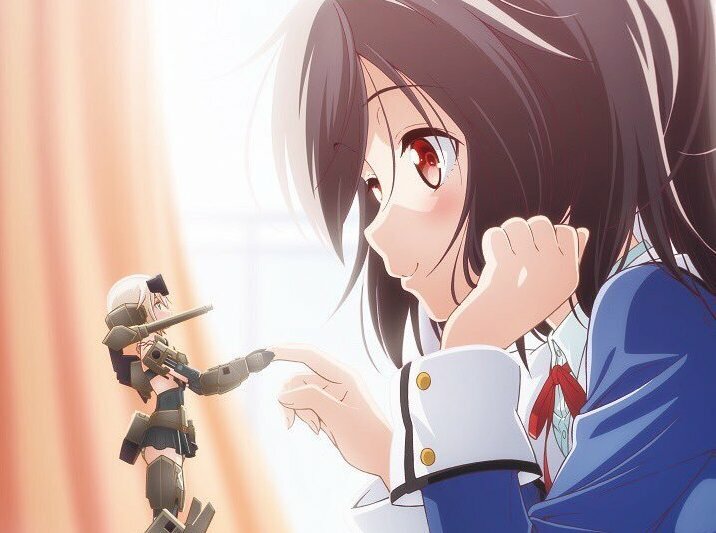 Frame Arms Girl, the anime series about female action figures who do battle, is getting a compilation film this June. This weekend at Wonder Festival, a new trailer for that film, Kyakkya Ufufu na Wonderland, was unveiled—and that trailer includes a preview of new song “Manjou Icchi (unanimity) LOVE ENERGY,” which is performed by all seven of the Frame Arms Girls. It’s unlike any anime you’ve seen before and should speak to anyone who loves spending time on Gunpla, model figures, or collecting things. Most of all, it’s a story about a young girl who ends up caring deeply for a set of autonomous dolls who not only become her allies, but her dear friends. Ao Gennai mistakenly opens a package that wasn’t meant for her, and, to her surprise, she sees a small robot named Gourai, a Frame Arms Girl who has an evolving personality. Confused as to how this little robot made it into her life, she finds out that she is the first person to activate her. She realizes taking care of Gourai is harder than she thought, especially when competitive fights are involved!